Click for details on how to join The Creative Actors Alliance! We host at least 10 FREE Acting Workshops a year for our members! Check our home page for the upcoming workshop date and time. As always, this event is FREE for members. Take advantage of this membership perk! NON-Members may audit one time for free, so you are welcome to bring a friend. Jeff Sable, our resident acting coach, usually leads our monthly acting workshop (unless we have a guest teacher). Jeff Sable received a Bachelor of Music Degree in Vocal Performance from the University of Southern California. Besides his extensive acting experience, Mr. Sable has served in many capacities behind the camera. Mr. Sable was the casting director for the feature films Black Hole and Blocked as well as numerous short films. His on set production experience ranges from production assistant to boom operator. Mr. Sable was the Associate Director of The Van Mar Academy of Motion Picture and Television Acting for seven years and has been a sought after private acting coach since 1983. In 2000, Mr. Sable became a Board Member of the Creative Actors Alliance, where he serves as the resident acting coach, in-charge of the monthly acting workshops, and as casting director for all Creative Actors Alliance projects. Creative Actors Alliance also gave him his first opportunity to direct the in-house sketch comedy short entitled Women’s World. HELP US HELP YOU BECOME A STRONGER, MORE VERSATILE ACTOR! When we do cold readings, your performance WILL BE CRITIQUED and you will be asked to do it again with adjustments. THANK YOU to past guest teachers at our monthly Acting Workshops through the years! Thank you to everyone who came out to support the work of our members! Creative Actors Alliance member, Patrice L. Barrie along with Pat Welles, wrote the novel 'DANCING IN THORNS.' We wanted to let you all know that there are 2 copies at the County Library at 625 North San Vicente Boulevard at Melrose, West Hollywood 90069.
first 15 chapters are mostly true, especially 12 and 13. NOTE: There was another novel that came out a month after this one, that was almost the same title, but instead on IN it was On, and by another person, so please do not be confused. Susan Grace writes GRACE NOTES...an industry standard for daily theatre news around the world since 1999.
at the New York International Film Festival 2011! Creative Actors Alliance member, Javelyn, licensed the use of her song "Baby" for our feature film, "Life at the Resort"! Javelyn will be hosting and performing the Java with Javelyn Indie Music Nites. Go to her brand new website, www.javelyn.net for the dates and times and other info. Javelyn has recently released a new CD - "Bustin' Loose". She is pleased to announce the next Java with Javelyn Indie Music Vol. 3 CD compilation. She has a few copies for $5. She is open for submissions for Java with Javelyn, Vol. 4 CD compilation. Go to www.javawithjavelyn.com to submit. FREELANCE MAKE-UP ARTIST, Yetem Kefale Worku...Beauty by Yetem will bring out your gorgeous features and accentuate your beauty at the hands of a Professional Artist. She has experience with ALL skin types and face shapes. She's available for Bridal, Print, TV/Film, Photoshoots/headshots and ALL other special events. She uses only professional and high-end products. For more info please contact Yetem by email Info@beautybyyetem.com. Bill Devlin's Comedy & Cocktails is Every Monday Night at at the Ramada Hollywood Hotel, 1160 N. Vermont Ave in LA. See Bill Devlin and other National Headline Comedians for FREE!!! Bill Devlin has a new Monthly Stand Up Comedy Show at the Hollywood Improv - Call Bill for show tickets 213-840-2546. Bill Devlin offers Creative Actors Alliance specials. Currently offering a discount to Creative Actors Alliance Networking Event Patrons and one referral to a friend. Email williamdevlin@earthlink.net or call: 213.840.2546. Also, check out www.billdevlinphotography.com . Roman Wyden of Roman Wyden Photography is offering Creative Actors Alliance a special rate. Call 818-642-2236 for more info. Adrian Carr of Tall Orders Productions is back shooting headshots. Normal rate is $500 but for Creative Actors Alliance members, he will only charge $350. Call 323-936-2081 to see samples of his work and make an appointment. Actors, got the part? Now promote it with a free photo shoot. Only pay for the postcards to promote your role. To qualify, you must have a speaking part in a tv show, feature or short film, local play, or national commercial. www.myspace.com/bethbphotoBeth Beacham of bb Photography, always offers Creative Actors Alliance member a special. She has a new promo where a different Actor promotes his or her role on her web page. I'd like other Actors to know about it so they can apply. Call to make an appointment today! 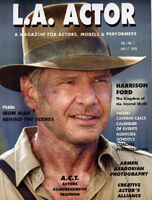 Karine Simon Photography is giving a $50 discount to Creative Actors Alliance members! Check out her work at www.karinesimonphotography.com. Peter Parker Photo Company does all digital headshots and is offering a special rate to Creative Actors Alliance members. You receive a free CD of your shots. For more info call 323-644-1643. If you have an announcement that you would like us to post, send it via email to talent@creativeactors.com and we will post it for you. We are always actively looking for philanthropies to support. If you have an upcoming event or cause and need some help, please email talent@creativeactors.com. Some Creative Actors Alliance Highlights through the years! On the Red Carpet at the Idyllwild International Festival of Cinema with our award! SEPTEMBER 2008, THE CREATIVE ACTORS ALLIANCE PRODUCTION, "OFFICE BANTER", WAS SCREENED AT THE 8TH ANNUAL VALLEY FILM FESTIVAL. 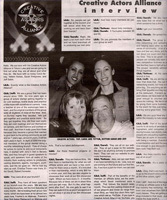 The Creative Actors Alliance Board Members were featured in the first edition of L.A. Actor - A magazine for actors, models & performers. 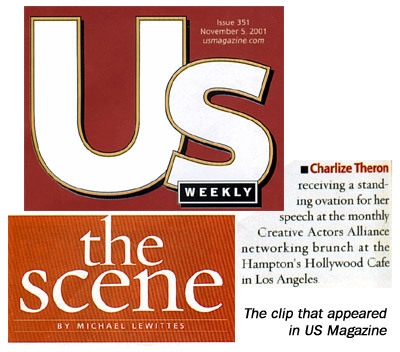 Check out Vol 1 No 1, May 17, 2008 issue to read about the Creative Actors Alliance. Thank you to Thomas S. Rubin, Esq and Steve Papkin, for your expert advice and legal counsel for both the Creative Actors Alliance, LLC and The C.A.S.T. Project, LLC. Thank you to Maurice Weiss for donating your studio space for our Acting Workshops. RIP. Thank you to Tommy Lee Ray for donating your office space for our Acting Workshops. Thank you to Frankies Restaurant for allowing us to host our monthly events at their fabulous location. Thank you to Zander of Z-Ville productions and Affordable Sound Stage for donating your space for workshops. Disclaimer: The Creative Actors Alliance, its affiliates, associates, friends, and guests are not responsible or to be held accountable for any posted announcements from third party supporters. We do not guarantee work from casting calls, nor take responsibility for the nature and/or content of any shows announced by supporters. Reviewing or attending any said events is purely at the reader's sole discretion. We also reserve the right to remove any post should the event or casting notice prove to be conflicting with Alliance morals, standards, or public conduct.